The Carolinian Life Zone of southwestern Ontario, which stretches from Toronto to Windsor, is among North America’s most vibrant and fragile ecoregions. This same area referred to as Canada’s “Deep South” makes up the distinct ecoregion know as the “Carolinian Zone”, including 2,200 plant, 70 tree and 400 bird species – more than any other region of Canada. The Carolinian Zone contains a third of Canada’s rare and endangered species, including 150 designated “Species at Risk”. The Carolinian region has a warmer climate than any other part of Ontario and supports ecosystems found nowhere else in Canada. The name “Carolinian” was coined by early botanists who noticed that hardwood forests in the area have many species of trees found as far south as the Carolinas. Carolinian is a label used within the Deciduous Forest Region in which Sassafras and Tuliptree are dominants. At one time there were a lot of American Chestnut. Co-dominants would include Black Walnut, Black Oak, White Oak, Red Maple, Pignut Hickory, and Black Gum. 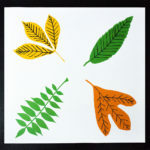 The quilt block features the leaves of Pignut Hickory (top left), American Sweet Chestnut (top right), Black Walnut (bottom left) and Sassafras (bottom right).